Defender Joe Skarz says there is no-one hungrier for an elusive league win than the Town players. The Shaymen are aiming for what would be a first National League victory in 13 attempts against bottom-side Dover at The Shay tomorrow. Their last league win was against Gateshead at home on August 27 when Jordan Preston’s goal on the stroke of half-time put Jamie Fullarton’s side top of the table. But they are now 16th in the division ahead of their meeting with basement-dwellers Dover, although they go into the game on the back of an encouraging performance in their 0-0 draw against League Two Morecambe in the FA Cup. “You can’t just get motivated for a Morecambe away in the FA Cup first round,” said Skarz. “You’ve got to get motivated for a Dover at home, where it’s going to be a scrap, it might not be pretty at times, and try to just grind out a win if that’s the case. “We know we need a win. We’re not stupid as a bunch of lads, we’re desperate for a win. “We come in every day and work really hard, and we’re desperate for that win. “You can see the fans are desperate for it, but the players are too. “There’s lads who have had success and won promotions, and we’re all desperate to get that win. “If we play like that, it will be round the corner. “But you’ve got to keep it going now. You can’t be complacent, you’ve got to be on it every day, be professional in everything you do. Skarz said Town’s display at Morecambe was “a really good performance”, especially coming a week after their disappointing 2-1 defeat at Havant and Waterlooville. “We wanted a reaction after last week,” said Skarz. “We were all disappointed after that result. “There were a few things said last week between the lads, that we needed to bounce back and man up a bit, fight and work for each other. “Not that we weren’t doing that, but sometimes you need a bit of a reality check, and last week was good. “We went there with a good game plan and we had chances to win it on the counter attack. Halifax put in a hard working performance at Morecambe, but Skarz insists that is the least The Shaymen should be doing. “I think that’s a given, but sometimes for whatever reason, there’s a perception when you’re losing games that that’s not the case,” he said. The Shaymen have tended to take one step forward followed by one step back in recent weeks, with positive results or performances preceding negative ones. “Maybe that’s why the players play at the level we do, because of the inconsistencies,” Skarz said. “But we showed that we more than matched a League Two team, and they’re a decent team, they’ve got good players. “We’ve had a draw at Wrexham where we should have won, we had a perfectly good goal disallowed. “Leyton Orient equalised in the 93rd minute against us. “Yeah, we’ve had a few poor games like Maidenhead away, Aldershot away, which isn’t good enough. “We’ve had good results away from home, some good draws, but we need to convert some of them into wins, like at Morecambe. Skarz had missed two games with a concussion he suffered in the 1-0 defeat at home to Eastleigh on October 27 before the trip to Morecambe. “You can’t help that, that happens,” he said. “I’ve been doing everything right while I couldn’t play, you’ve just got to accept that. “I’d rather that than get a long-term injury. “You just have to follow FA protocol for the week after, where you have to go through different stages. 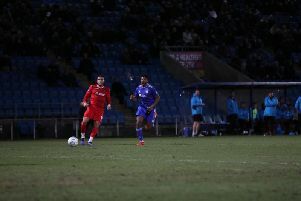 Skarz is happy to have featured regularly for Town since making his debut in the 2-1 defeat at Boreham Wood on August 25. “I think I’ve played 11 games since I’ve been here, so I’ve generally got a good run going,” he added. “I need to keep doing the right things, keep training well, keep trying to get better. “Even when you’re 29 you can still aim to get better.